■■ MAURITIUS: New Terminal 2 at SSR International Airport to be ready by August. Built and ultimately to be managed on behalf of the Mauritian Government by Aeroports de Paris in collaboration with China State Construction Engineering Corporation, the new Terminal 2 at Sir Seewoosagur Ramgoolam International Airport in Plaisance, Mauritius is slated to be operational by early 2013. The new terminal is designed by ADPi, Architects and Engineers and Alain Davy, Architect. Built at a cost of MUR11billion (USD260million), 85 per cent of project is to be financed by a loan from the EXIM Bank of China to the Mauritius Port Authority at a concessionary rate of 2% for a period of 15 years. ■ TANZANIA: Zanzibari lawmakers irate at cost overruns, poor workmanship at new airport terminal. The Zanzibari House of Representatives has taken the government there to task over continuous delays and cost overruns in the construction of an urgently needed new international terminal (Terminal II) at Zanzibar's Abeid Amani Karume International Airport. ■ MAURITIUS: Two new hangars at SSR International Airport inaugurated. The Airports of Mauritius Co Ltd. today inaugurated two out of the five new aircraft hangers at Sir Seewoosagur Ramgoolam International Airport in Plaisance, Mauritius, that will be used for long-term aircraft parking. The inauguration comes as tomorrow (Tuesday 12 March), Emirates (EK) will operate a one-off Airbus A380 flight to the island to mark the 45th Anniversary of Mauritius' independence from Britain. 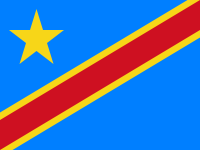 ■ CONGO (KINSHASA): RVA launches study for new cargo facility at N'djili International Airport. The Democratic Republic of the Congo's aviation authority, Régie des Voies Aériennes de la République Démocratique du Congo (RVA), has embarked on a €280'000 study for the construction of a new cargo facility at Kinshasa's N'djili International Airport.